The Land: The Barn is secluded, private, completely fenced and gated/locks with ample private parking for guests only right next to The Barn.The grounds are mainly mown meadow planted with olive, cypress, parasol pine, maple, eucalyptus and wild flowers, ideal for a gentle stroll before aperitifs. Swimming pool: 13m x 6m including Roman Steps X 1.2m sloping to 2.2m deep. The tiled poolside area, sun loungers and sun brolly are exclusively for guests and NO pump noise! A gentle saline pool (no sore eyes or green hair), underwater and poolside lighting. 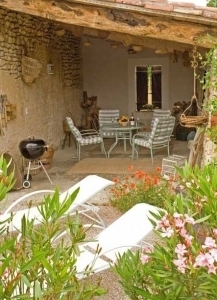 A lovely restful spot, sunny all day, with views toward woods and vineyards. Open April - October. 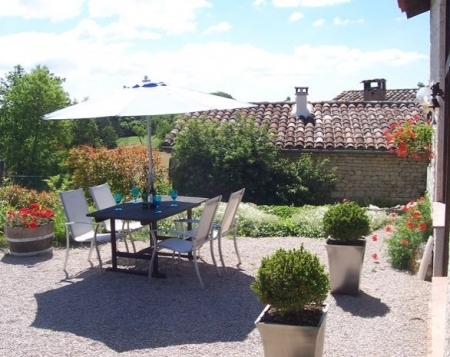 Covered terrace: adjoins the Barn, with power socket, table, seating, lighting and barbecue. A cool shady private outdoor area; another option for relaxing and eating in the shade or taking in spectacular sunsets. Open living area: light and airy, original exposed limestone walls, stunning oak timbers and high ceiling. Fully tiled, heated and double glazed throughout. Large picture windows and French doors overlook the swimming pool, meadow and wood. Guest facilities: 18 Mb no charge unlimited broadband (wifi or Ethernet), 'Freesat' English TV receiving all BBC, ITV digital channels, Ch4, 5, Film 4, News Channels), DVD player (some movies and quality TV programs supplied by us), CD and MP3 (via USB) stereo player, (USB cable not supplied). Don't forget to bring your UK to French plug adapters, especially for your laptop computer and phone charger! Regrettably 'The Barn' and pool are unsuitable for those under the age of 18 and pets. We ask guests not to smoke in The Barn. The let begins Saturday 4pm, ends Saturday 10am (Local time) to allow for The Barn to be thoroughly cleaned for our guests. 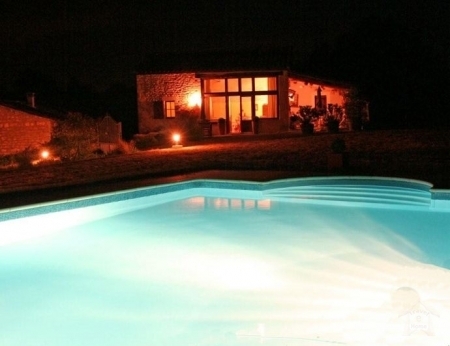 NO hidden charges, Electricity, water, hot water, heating and use of pool are included. Regretably metered electricity sadly must be charged during Nov., Dec., Jan., Feb and March. However guests pay the same rate as we pay for the main house. (The Barn is quite cozy, double glazed and well insulated throughout to current standards). 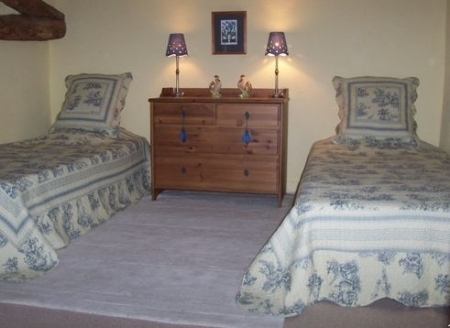 Linen is included and changed weekly: sheets, duvet covers, pillow cases, towels bath mats and tea towels. (But please do bring just your own pool towels). Comprehensive cooking utensils, oven ware cutlery, crockery for four guests and of course a tea pot and bottle opener are included. We ask for a 50% (£) deposit with your booking. The balance with a £150 refundable 'damage' deposit is required 8 weeks prior to your arrival please. UK cheques payable to Paul and Kay Evans. 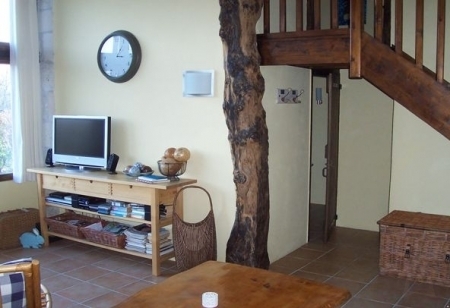 Post: Le Jouvenal, Villeneuve sur Vere, 81130, TARN, France. (Post is reliable between 3-7 days. If you prefer electronic funds transfer do please advise us). Ferry, hire car and insurance discounts: see the French Connections and Chez Nous websites, you may need to quote our ref #. Our cancellation Policy: should we be able to rebook the Barn we will of course refund you. We strongly recommend you arrange Insurance against the cancellation of your vacation. ** The 18Mb Internet connection, (actual download speed typically 9-11Mbps), is suitable for Microsoft XP +(with wifi adapter or ethernet connections) and Apple OSX (with Airport Card). We do provide a connection guidance sheet, but we rely on guests to be able to setup and connect their computers to the Internet. Installed in The Barn is a 'Netgear 54Mb wireless modem/router '. We can loan guests a standard ethernet cable if required. NB. Our ISP is reliable (and proven by our guests), but of course we remain entirely dependant on the ISP. To help you settle in after your journey in the Barn, we welcome you with 'emergency iron rations'. Bread, butter, milk, tea, coffee, eggs and a good bottle of wine from a local vineyard. We contact you just prior to your journey to confirm your itinery, 'iron rations', your wine preference, and, if you wish us to reserve a table at 'Lou Cantoun' our local popular restaurant table just 4 minutes drive away. (See left le chef M. Bernard). We can offer long Winter letting discounts, do please enquire.